Easy Cheesy Scalloped Potatoes is the ultimate side dish of perfectly cooked potatoes in a rich sharp cheese sauce and baked crisp in the oven. 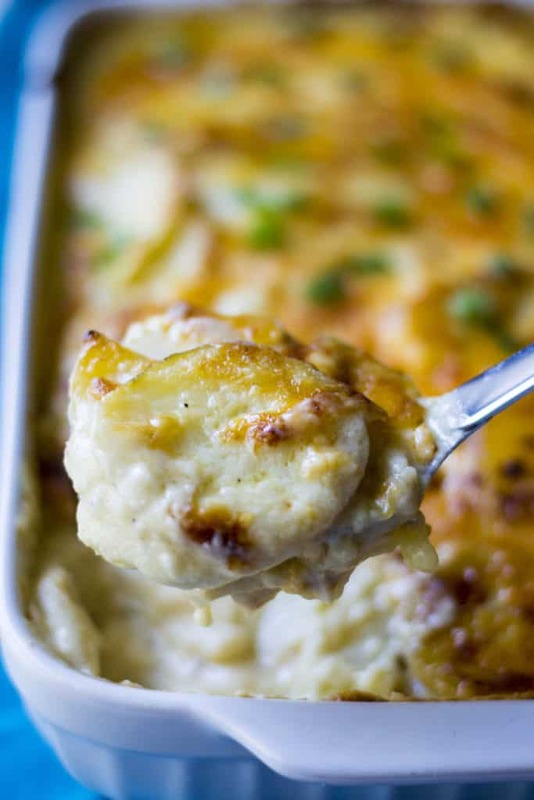 These Easy Cheesy Scalloped Potatoes are irresistible! Can we take a minute to talk about easy cheesy potato side dishes? 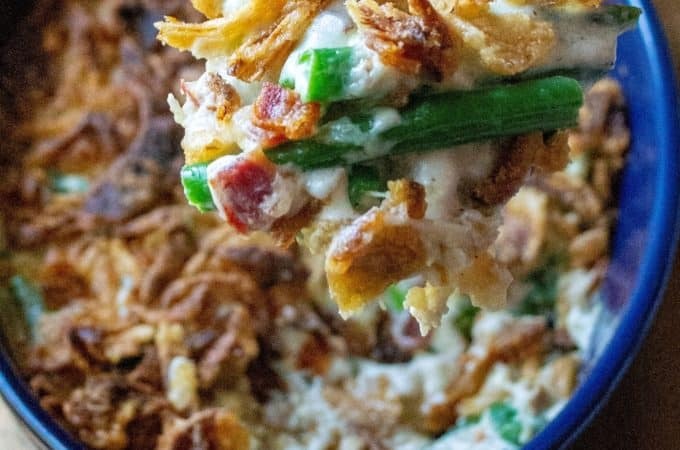 As I mentioned in my Loaded Mashed Potato Casserole post, I totally dig potatoes! I love side dishes and if those side dishes are also easy cheesy potatoes, it is a win-win for this Irish girl. Believe me, I will destroy that potato side dish three-quarters of the way through before I even look at whatever that main food item might be. So when I bring a steaming hot casserole dish full of Cheesy Scalloped Potatoes to the dinner table, you better believe my husband knows he needs to portion out his before I even get near that bowl. Scalloped potatoes can be intimidating. Cook those scalloped potatoes too long, they are mush. 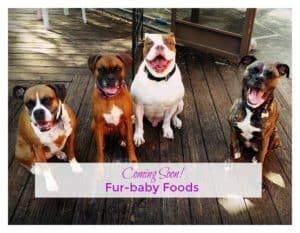 Don’t cook them long enough and they are crunchy. And let’s not even talk about how much salt to use …. I myself know that it took me rewriting this Cheesy Scalloped Potatoes recipe probably five times before I finally had a recipe to fall in love with. This is that recipe! DO I NEED TO ADD HAM TO MY SCALLOPED POTATOES? No, you do not need to add ham for the dish to be scalloped potatoes. 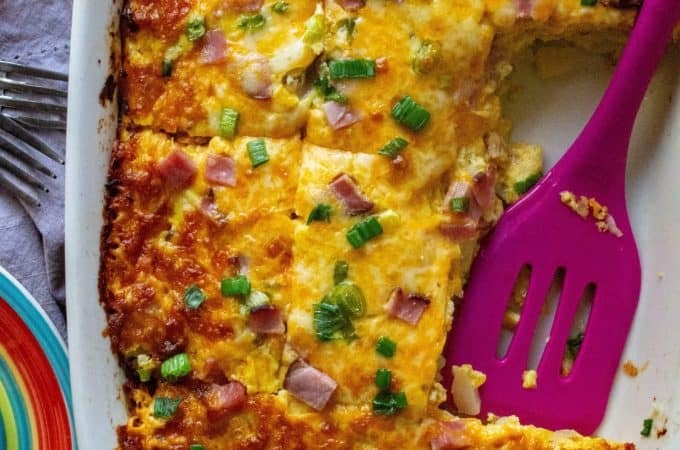 Any cheesy scalloped potatoes recipe can include ham, if you like, but it is no required. The main difference between scalloped potatoes and au gratin potatoes is cheese and thickness of the potatoes. In scallop potatoes recipes, the potato slices are thicker than they are in an au gratin potato recipe. Also, in au gratin potatoes, you use mostly Gruyere cheese whereas in scalloped potato recipes you would use mostly cheddar cheese. 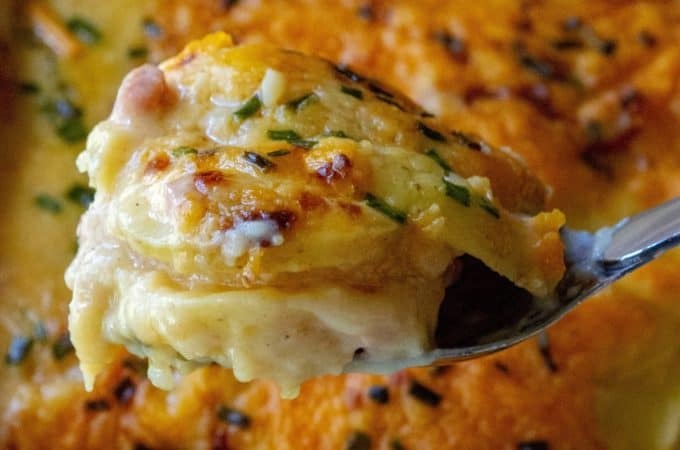 HOW DO I MAKE CHEESY SCALLOPED POTATOES? To make your Cheesy Scalloped Potatoes start by peeling (or not peeling if that is your preference) potatoes and slicing them all thin, approximately 1/4 of inch wide. Add potatoes to a large pot of salted water and bring to a boil. Boil potatoes for about 10 minutes. Using a fork, check for doneness. You only want your potatoes to just be fork tender, not too soft. Drain water and return potatoes to the pot. Preheat oven to 350 degrees and spray 9×13 pan with non stick spray. In a large skillet, add butter and melt over medium-high heat. Stir in onion and cook for 2 minutes. Add garlic and cook for another minute. Add in flour to skillet and whisk together with butter/onion/garlic and cook for approximately 1 minutes, whisking continuously. Pour in milk and cream and continue to whisk until all ingredients are smoothly incorporated. Add spices into the mixture and continue whisking until it comes to a low boil. Add in cheeses and stir to combine until incorporated and cheese has melted. Add 1/3 of the potatoes to the baking pan and pour 1/3 of the cheese sauce over them. Add another 1/3 of the potatoes and add another 1/3 of cheese sauce. Finish with the final layer and move the pan to the oven. Bake for 25 minutes then remove from oven and let set for 10 minutes. 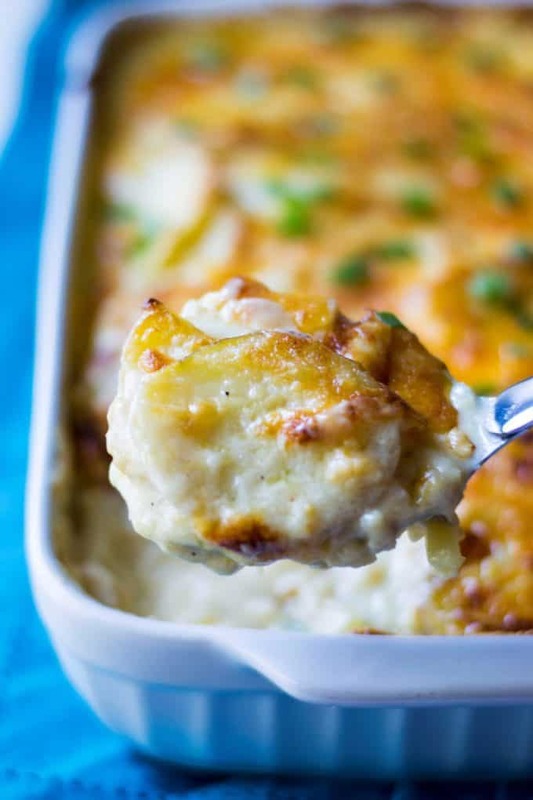 Garnish Cheesy Scalloped Potatoes with chives, parsley or green onion and serve. 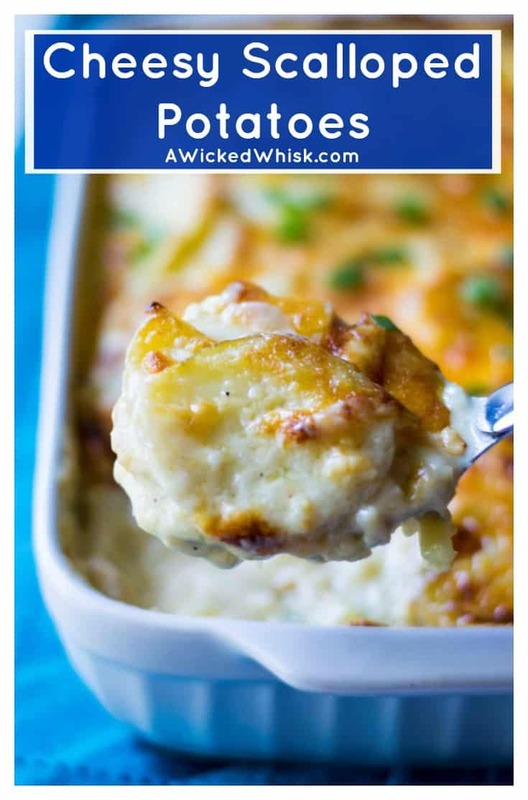 This Cheesy Scalloped Potatoes recipe is super easy and even someone who maybe doesn’t cook that often will be able to serve up an amazing easy cheesy potato dish with no problems whatsoever. The trick is to boil the potatoes for about 10 minutes first and that way they soften up and you don’t have to cook your scalloped potatoes in the oven for an hour and a half. 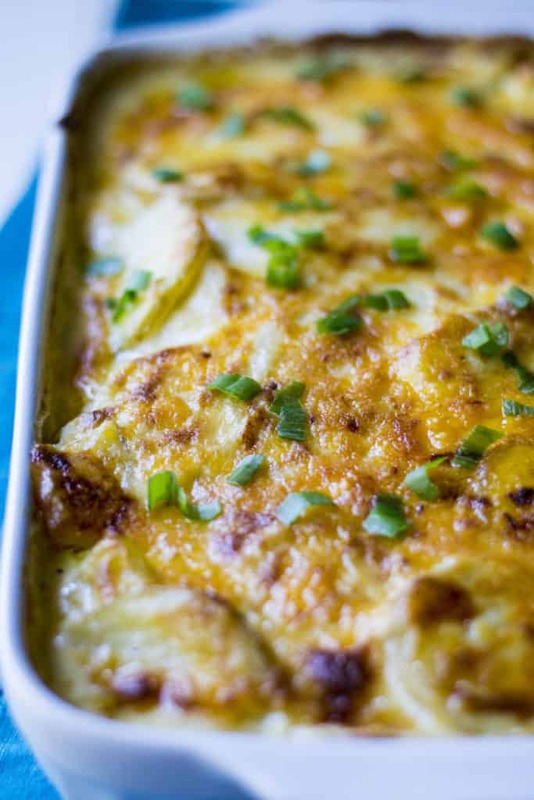 This cuts down on the Cheesy Scalloped Potatoes cooking time tremendously! Once those potatoes are boiled, the rest is easy. So whether you are preparing a big meal for your family and friends this weekend or you are just looking to treat yourself, I hope these Cheesy Scalloped Potatoes make it to your dinner table soon. Start by peeling (or not peeling if that is your preference) potatoes and slicing them all thin, approximately 1/4 of inch wide. Add potatoes to a large pot of salted water and bring to a boil. Boil potatoes for about 10 minutes. Using a fork, check for doneness. You only want your potatoes to just be fork tender, not too soft. Drain water and return potatoes to the pot. Preheat oven to 350 degrees and spray 9x13 pan with non stick spray. In a large skillet, add butter and melt over medium-high heat. Stir in onion and cook for 2 minutes. Add garlic and cook for another minute. Add in flour to skillet and whisk together with butter/onion/garlic and cook for approximately 1 minutes, whisking continuously. Pour in milk and cream and continue to whisk until all ingredients are smoothly incorporated. Remove from oven and let set for 10 minutes. Garnish with chives, parsley or green onion and serve. If you are able, buy block cheese and shred it yourself.. the preservatives in bagged pre-shredded cheeses will produce a more greasy dish.